**~ A POCKET FULL OF ROSES~**: MY BEAUTIFUL DAUGHTER!!! Oh she is so pretty ~ you must be so proud! Cute haircut!! Your daughter is just as beautiful as you. I love her red hair and how sweet of her to donate her hair to locks of love. Beauty! So sweet of her to donate her hair. Blessings to you both! Now girly this is precious! You raised a girl with a heart full of love and that should make you super proud. Gosh...she's beautiful, too! Wow! Those lips! Oh Mari, Congratulations to your beautiful daughter being picked for the month of October..... I think she looks fantastic and a perfect picture to represent the Hair Salon with a striking hair cut like that. Mari she is gorgeous!!! But what else could one expect! Beautiful, and how incredible to cut her hair for such a great cause!! What a natural beauty! Congrats! She is cute Mari!Love ehr eyes.My girls and I are all blue eyed.My husband had brown.We won out,lol.So nice of her to give her golden locks to Locks of Love,such a great cause. Thanks for passing through my blog today and leaving a nice comment.LOL I thought he was adorable.I remember back families when I was young dressed kids up like that in the wintertime. Oh Mari, she is STUNNING!!! Hi Mari, Your daughter has the most beautiful blue eyes and she is stunning. Locks of Love is such a great charity and how wonderful that she donated her hair. Hi Mari, What a stunner, The bluest eyes! All that and a heart of gold, locks of love is so cool! First of all I must thank you for stopping by my blog and leaving me a message. By doing so you allowed me to find YOUR blog and I love love love it! Everything is so pretty!!! Your daughter is beautiful and I just adore her hair color. No wonder she was picked. Mari your daughter is so pretty! What beautiful blue eyes. I love her hair style and color. I can see why she was chosen. 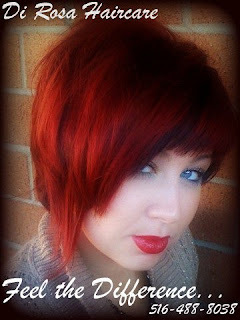 Your daughter is gorgeous and I love her hair cut and color. She is a beauty like her mother. Congrats to her for being picked for the month of October's hair style in her salon. Wonderful and hugs to her! Have a wonderful weekend and sending smiles to you. I know you are sooooo very proud of your beautiful daughter! She is stunning! !